Rare Early Della Robbia Pottery Jug, 1894, of swelling form applied with angled handle, hand painted with cherubs playing musical instruments, one cherub standing on a vase, all within a wreath, winged angels supporting the wreath either side, on an elaborate colored spiraling foliate ground, painted DR Ship over waves mark, 1894, 13½" high. Some glaze chips. Rare Della Robbia Pottery Ink Well, 1894–1900, hand modeled with two sirenes, holding each other, another the foot of the inkwell, incised mark, Irish Clay, DR with a ship, Pottery, Birkenhead, Eng, 3” high, glaze chips. 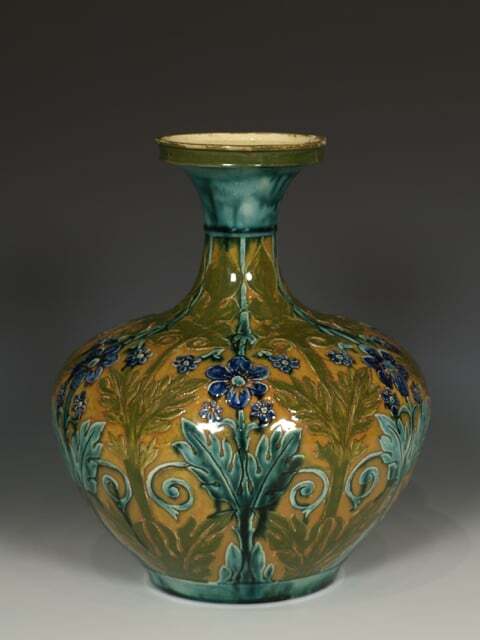 Della Robbia Pottery Vase, c.1898-1900, by Liz Wilkins and Charles Collis, with elaborate incised foliate decoration in vertical repeated panels, 10¾” high.